This book for toddlers explains the difference between today, tomorrow and yesterday, and that tomorrow will soon be here. Maya`s sad because her mother`s going away for work and will only be back tomorrow. "When is tomorrow?" Maya asks. "It`s after today," her mom answers. After she leaves, Maya doesn`t want to do the things she usually does. When she comes home from kindergarten with Dad, she tells him that she doesn`t want to eat or have a friend over. She only wants Mom to come home. "She`ll be home tomorrow," says Dad. In the evening, he makes her an omelette, washes her hair and tells her a story, but Maya says that Mom does these things better. Dad isn`t offended, though. He agrees that there`s no one like Mom. The next morning, Maya asks whether now it`s tomorrow, and her dad answers, laughing, that now is today, and yes, Mom is coming home. But Maya objects: "You said she`s coming home tomorrow." "That was yesterday," says Dad. "Today is yesterday`s tomorrow." When Mom arrives, she gives Maya a big hug. Maya says it was fun, but it`s more fun when Mom is there. "For me too," says Mom. "Let`s spend tomorrow all together!" But her dad can`t, he has to work. "Let`s do it the day after next," he suggests. And Maya immediately asks: "When is the day after next?" 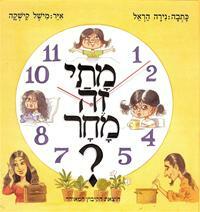 Book title - Hebrew (phonetic) Matai Ze Machar?